You’ll feel you’ve travelled back in time as you pass down a winding mountain road deep into an isolated valley of Kanangra – Boyd National Park, drive through the cave entrance and arrive at the enchanting hideaway village of Jenolan. Regarded as Australia’s most outstanding cave system, Jenolan Caves is among the finest and oldest cave systems in the world. A specialised guide will take you underground for an amazing cave tour experience! 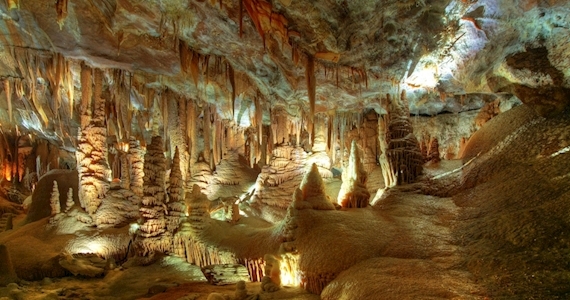 NOTE: Upgrade to an amazing Adventure Cave tour by paying an additional cost. Select the option when booking. We travel to the end of a dirt road through the forest to a clearing where wild kangaroos and wallabies graze quietly within camera range. Photo opportunities like this are rare so we need to be as quiet as possible. One of the most awesome lookouts in the Blue Mountains with views looking into the Grose Valley, wilderness as far as the eye can see and the magical Bridal Veil Falls. The famous Three Sisters rock formation is one of the most iconic images in Australia. The views overlooking the Jamison Valley are incredible and as well as getting that classic photo, you’ll hear the stories of the local Aboriginal legends.